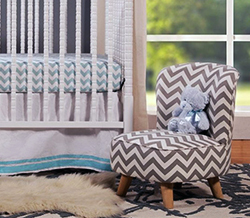 We have lots of pictures of chevron baby nursery ideas for baby boys and girls on this page using what some call chevron print or zig zag or what others might refer to as chevron stripes. Whatever you call it; on this page you will find many ways to introduce this pattern into your DIY decorating whether your vision is for the ultimate in chic decor or a rustic nursery. There are gender neutral designs featuring zig zags in unisex as well as the most popular color combo, aqua blue and grey. There are rooms striped with the brightest and the boldest of colors as well as examples in pastels as soft as a baby's sigh. A grey and white zebra with a chevron area rug and tufted pouf and chair in solid color is a delightful blend of patterns and textures in a continuous color scheme. look amazing with zebra print bedding and accessories. various items featuring chevron print that can perhaps be included in addition to the decor that you already have in place to give your child's room a fresh, new look. Blending chevron with other patterns and prints is a popular trend that adds both interest and contemporary style to a space as we have demonstrated in this example. Cruise the yard sales, secondhand and consignment stores in your spare time to find chairs that can easily be upholstered in chevron fabric. 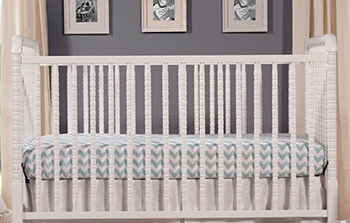 Popular color combinations for chevron stripes seen in many of the latest baby nursery themes are neutral but they should by no means be regarded as "dull". As you see, the results of mixing matching stripes of varying types and color can be particularly stunning! Please take note of the stripes that have been successfully included here. And they all work beautifully together, don't you agree? Unique Baby Gear Ideas would like to see or hear ways that our visitors incorporate this trendy print in their nursery projects. 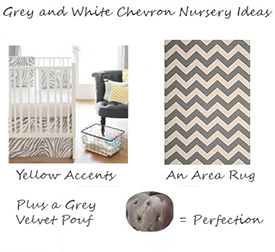 We would also like to see pictures of your chevron baby nursery ideas. So, please use the form we have provided for your convenience to upload pictures of any room designs where chevron has been used to create or enhance the decor.